Reward Health Sciences has developed a framework for clinical practice improvement and care management based on years of experience. This framework has been published and presented extensively. In addition, Reward Health Sciences uses rigorous methods adapted from the fields of medical informatics, clinical epidemiology, biostatistics, medical decision sciences, health services research, and statistical process control theory used in the manufacturing sector. This approach is generalizable across medical specialties and care-delivery settings. 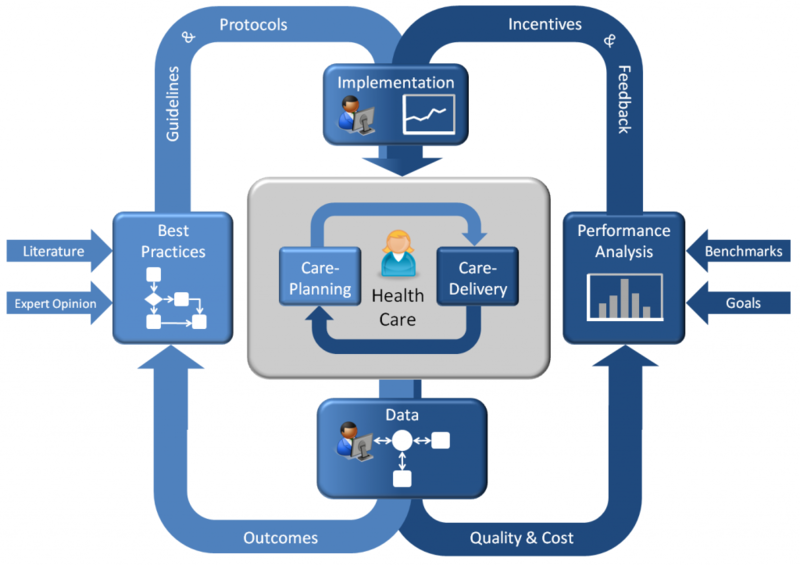 On the most general level, all of health care can be conceptualized as a system involving two fundamentally different core processes: care-planning processes and care delivery processes. Care-planning processes involve a clinician working with a patient to determine which, if any, health care interventions should be pursued at a given point in the patient’s care for each of the health problems facing that patient. In this context, health care intervention is used broadly, encompassing everything from deciding on the components of a physical examination, to deciding whether or not diagnostic testing, or pharmaceutical or surgical treatment is needed. 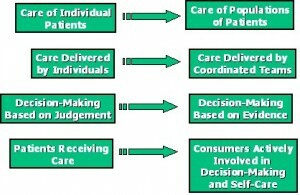 The output of this decision-making process is the plan of care for the patient. 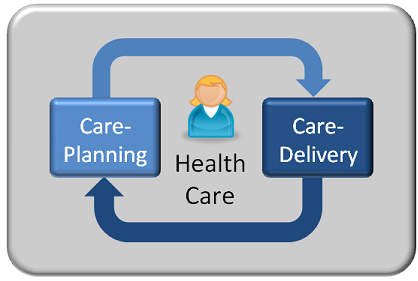 The care delivery process, in contrast, involves the execution of the plan of care. The results of executed interventions, in turn, affect subsequent decision-making. Even the most complex clinical processes can be broken down into cycles of deciding on a plan, executing the plan, and deciding on the next plan based on the results achieved. Quality is defined differently for care-planning and care delivery processes. For care-planning processes, quality means “doing the right thing” — identifying the right alternatives and choosing the right one. For care delivery processes, quality means “doing it right” — carrying out the plan of care without making mistakes and without wasting resources. Research over the past four decades has repeatedly shown great variation in clinical decision-making and care delivery which could not be completely explained by patient characteristics. This observed variation has served as a wake-up call to the health care community, prompting interest in the process of clinical effectiveness as a means to introduce a more rational, science-based approach to both decision-making and care delivery processes. 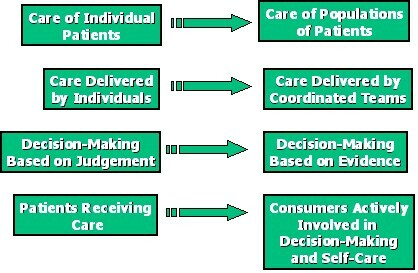 The figure below illustrates how decision making and care-delivery processes fit into the Reward Health Sciences “Care Process Improvement” framework. Given the appropriate technology and organizational will, measurement of outcomes, quality and cost can be incorporated into routine health care processes. Outcomes data include characteristics of the patient, their risk factors, and the medical interventions that were offered to them. Outcomes data also includes both immediate and long-term health and economic outcomes experienced by the population, including functional status, quality of life, satisfaction, and costs. More detail on methods of outcomes measurement are available here. These outcomes data can be combined with information from the scientific literature and with expert opinions to support the process of establishing best practices. In this context, “best practices” refers to any prospective decision about a use of health care interventions for patients in a particular situation. Establishing best practices involves the use of various methods to analyze proposed alternative practices and reach consensus about the most desirable alternative. Those decisions can take the form of clinical practice guidelines, care-maps, critical paths, disease management protocols or algorithms, practice parameters, or formularies. Decisions about which medical services are to be covered in a health plan, which clinicians are to be granted credentials to provide a particular service, or which medical technologies are to be included in a capital budget are also best practices. Such best practices are intended to support the decisions of clinicians, rather than to replace critical thinking and judgment. More detail on methods for establishing best practices is available here. In addition to outcomes data, routine measurement includes quality and cost indicators (and associated “appropriateness”, “utilization” and “efficiency” measures). Such measures are used for report cards, practice profiles, and other forms of performance reports. Quality and cost indicators form a feedback loop to confirm that the improvement effort is achieving the planned change in a clinical process. In addition to providing feedback to the improvement effort, quality indicators are often used as the basis for accountability to external constituencies. More detail on methods of quality and cost measurement is available here. Recognizing that written best practices and performance reports are not useful unless they are used to modify clinical practice, a critical component of the care management process is implementation, as illustrated in the following figure. Feedback of performance data is a required component of the successful implementation of best practices — consistent with the often quoted phrase “you can’t manage what you can’t measure.” Measurements are particularly effective when they are aligned with and drive incentives. Other important implementation methods include staff training, continuing medical education (CME), patient education, and the establishment of inter-disciplinary quality improvement teams. These methods can be effective when attention and resources are focused on a small number of practice improvement initiatives in a limited setting. However, experience has revealed that these methods, by themselves, are not scalable and durable. That is, addressing large numbers of improvement opportunities, rolling out innovations across many sites, and keeping changes in place over years has been elusive. Experience has shown that scalable, durable care management requires a clinical information technology infrastructure which is not available to the vast majority of clinicians. The type of technology required depends on the type of care management initiatives being undertaken. More detail on methods for implementing best practices is available here. As illustrated in the figure below, initiatives can be motivated by quality improvement, cost savings, or both. 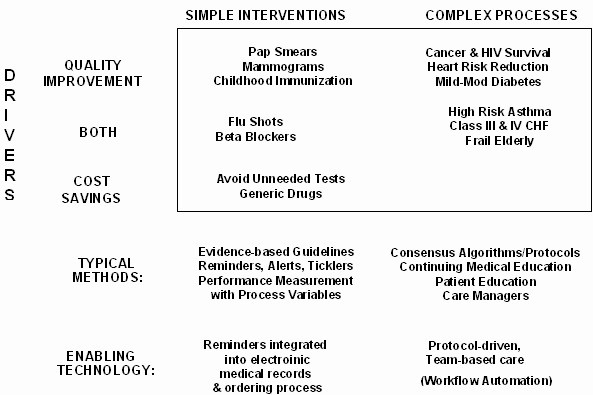 Initiatives can be focused on simple clinical processes, involving the delivery or avoidance of specific medical interventions to specific cohorts of patients. Or they can be focused on complex processes, involving the coordination of many different clinicians, from different disciplines to deliver a series of interventions over time. A number of core elements are key to ensure the success of any care management initiative. 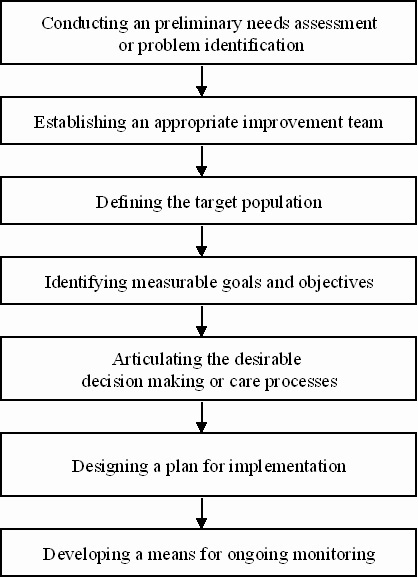 As illustrated in the figure below, these elements include: conducting an preliminary needs assessment or problem identification; establishing an appropriate improvement team; defining the target population; identifying measurable goals and objectives; articulating the desirable decision making or care processes; designing a plan for implementation; and developing a means for ongoing monitoring. Although these elements are necessary, they are not sufficient. Ultimately, the success of each clinical effectiveness initiative is dependent upon the ability to tailor the overall approach to the specific application. This step-by-step approach is described in more detail here. To demonstrate these concepts, the following examples are provided. These examples are drawn from work carried out at the Henry Ford Health System (HFHS) Center for Clinical Effectiveness (CCE), and represent a sample of the experience-base of Dr. Ward. These examples illustrate how the emerging discipline of care management can result in measurable improvements to important health care processes by employing a systematic approach, involving best practices, quality and outcomes measurement, and a multi-faceted approach to implementation. To enable success, clinicians work with other members of their clinical team and enlist the support of expert care management consultants. They draw from the rich methods and tools of diverse disciplines, including clinical medicine, epidemiology, statistics, medical decision sciences, economics, psychology, industrial engineering, management sciences, education, and medical informatics. A number of important challenges remain, however. Overall health care quality is the sum of the quality of thousands of decision-making and care-delivery processes. The examples described above comprise a tiny slice of overall health care quality. It is unlikely that the level of resource intensity and leadership attentiveness that was applied to these examples could possibly be applied simultaneously to more than a few dozen processes within most organizations. Therefore, it is critical that the practice of care management be an integral part of the overall practice of all clinicians. Only then will these methods scale up to the enormous task of improving thousands of health care processes. Three fundamental changes in the health care environment are required to support clinical process improvement on a large scale. Incentives. The incentives facing health care organizations and individual clinicians for improvement must be increased. The growing interest in external performance measurement such as with HEDIS measures is a step in the right direction. But overall quality improvement is likely to require a market structure where health care organizations face competition based on quality rather than only price competition and where the compensation of individual clinicians is driven by quality measures rather than only work effort. However, clinician-level quality measurement is a difficult proposition. Patient variation makes clinician to clinician comparisons difficult, even for the most common clinical practices. The subset of practices that can be measured represents a small fraction of all clinical practices. As a result, incentivizing clinicians to focus on improving measurable processes is like encouraging students to “study for the test,” calling into question the generalizability of the measures to assess overall practice quality. Furthermore, some warn that the use of quality measurement to drive clinician incentives or as a basis to identify “bad apples” for remedial attention is counterproductive to the use of measurement for learning and improvement. Clinician Education. The second fundamental change needed is the education of clinicians in the methods and tools of quality improvement, as adapted from the various disciplines described above. More substantial changes are needed in medical school curricula, residency training, board exams, and perhaps also in the criteria used for medical school admissions. Information Technology. The third fundamental change needed is a substantial investment in information technology to support clinical practice. Although information systems have been applied to administrative processes within health care organizations, the sophistication of systems to support patient care and quality improvement is lacking. Other industries, such as financial services and manufacturing, invest a substantially larger portion of their budgets to information technology. Scaleable, durable quality improvements will require systems that offer three important capabilities. First, information systems must permit the acquisition of structured data on patients, health care interventions and outcomes as part of the routine care delivery process. Second, information systems must offer decision-aids such as reminders, alerts and prompts to clinicians at the moment that clinical decisions are being made. Third, information systems must facilitate the complex logistics of coordination of care involving many disciplines in many settings according to protocols and guidelines. Therefore, an additional responsibility falls upon the shoulders of clinicians. In addition to patient care (providing care to individuals), and care management (working to improve the care of populations), clinicians have a responsibility to advocate and drive change in their environment to enable large scale, durable improvement. In a world with incentives, education and technology to support quality improvement, the public can expect dramatic, measurable improvements in the overall effectiveness of our health care system. A bibliography supporting this approach to care management is available here.